Fission and fusion are two different types of reactions in which large quantities of energy are released. Though energy is released during both fission and fusion reactions, the main difference is that fission is the process of splitting of an atom into two or smaller particles and fusion is the fusing or joining together of two or more smaller atoms to form a larger one. While fusion takes place in nature like stars, fission normally does not occur in nature. Fission happens with heavy elements like Uranium and fusion evolves lighter elements. Fission and fusion happen in different conditions. Fission requires large Critical Mass and a slow neutron to initiate the process. Fusion happens when two nuclei come very close together. They join together only if the active force between them is capable of overcoming the electrostatic force that binds it. In terms of energy requirement for the two processes, fission only needs a low energy for splitting the atom, whereas fusion takes place only under massive energy. Fusion requires tremendous energy to conjoin two nuclei. Fusion reaction is considered to be more environmental friendly to produce nuclear energy. If the reaction goes out of control in fusion, the whole process stops automatically as it cools down, which means that radio active participlesÂ do not spread out. The maximum damage of a fusion reaction is only the vaporization of anything in the vicinity of the reaction. But if fission reaction goes out of control, a nuclear melt down can happen which can cause the emission of radioactive participles ion in larger quantities. When comparing the radioactive waste produced by these two reactions, the radioactive waste that comes with fusion is very low than what is produced by a fission reaction. Fusion also produces more energy and it may be three to four times greater than fission reactions. Though fusion produces more energy and it is less dangerous than fission reactions, fusion reactors are yet to be developed.Â In fact it is more costly to develop the conditions that are needed for a fusion reaction. Fission happens because of chain reaction, and no chain reaction happens in fusion. 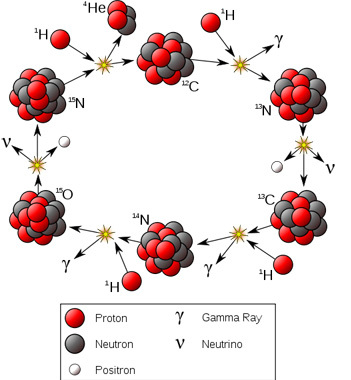 In fission, the chain reaction happens due to the interaction between neutrons and fissile isotopes. Meanwhile, fusion occurs only under extreme temperature and pressure. Another difference between fission reactions and fusion reactions is that the energy from fission can be controlled but it cannot be controlled in fusion. Prabhat S. "Difference Between Fission and Fusion." DifferenceBetween.net. October 11, 2011 < http://www.differencebetween.net/science/difference-between-fission-and-fusion/ >.